After our positive experience visiting Bali in 2011, I’ve always wanted to go back again. Hence when given the opportunity to head back to the island for a 3D2N tour, I was more than happy to plan a trip that maximises what we can do. So instead of a normal vacation, we made it a road trip! P/S: contest to win an Agoda travel voucher worth RM 1,000 at end of this post! Our itinerary to Bali started on a flight on Friday morning and ended on Sunday night, a total of 3 days with 2 nights spent on the island. Instead of taking a cab to the airport, we decided to drive. Parking fair at the KLIA long term parking came up to RM 130 or so, which is still a little bit cheaper than taking a cab. Soon as we touched down, I stopped by the ATM to withdraw some Indonesian Rupiah using my Visa debit card for places that doesn’t offer credit/debit card payments. Denpasar airport does not have any car rental booths, so do plan ahead if you want to rent a car, otherwise it’s another hour’s wait for the car to arrive. We rented a Toyota Avanza for our trip. I opted for self drive (armed with GPS brought from Malaysia), but you can get one with local driver too. Check out some of the offers exclusive to Visa for car rental here. There is also a Mobile App you can download for iOS & Android devices that allows you to check the latest Visa offerings. Additionally, there is the Global Customer Assistance Service available where you can get emergency card replacement in as little as within 24 hours. Coincidentally, we met Firdy at the airport. While we traveled cashless, this guy went one step further and didn’t even bring any luggage! He ended up joining us for half our trip. 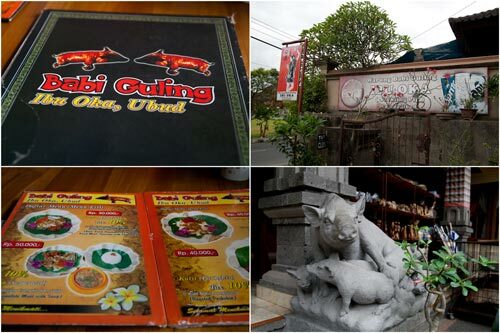 First order of business was lunch, and when in Bali, one must have Babi Guling! 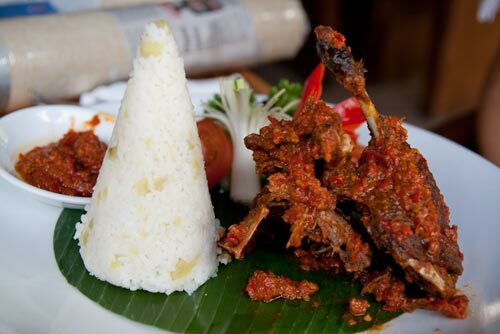 To be honest, my previous experience of babi guling at the famous Ibu Oka was not exactly very positive, but this version at Sanur (around 30,000 IDR per person) completely changed my mind about this unique Balinese dish. It was very, very good, I’d definitely go there again on next Bali trip. 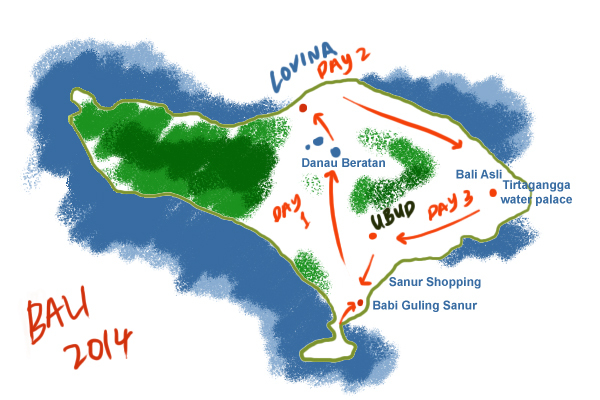 From Sanur, we got on the road and cut through the middle of the island on the way to Lovina. 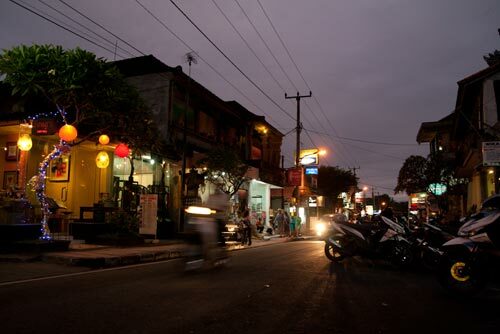 Roads in Bali are usually pretty tight, which makes for some challenging driving. 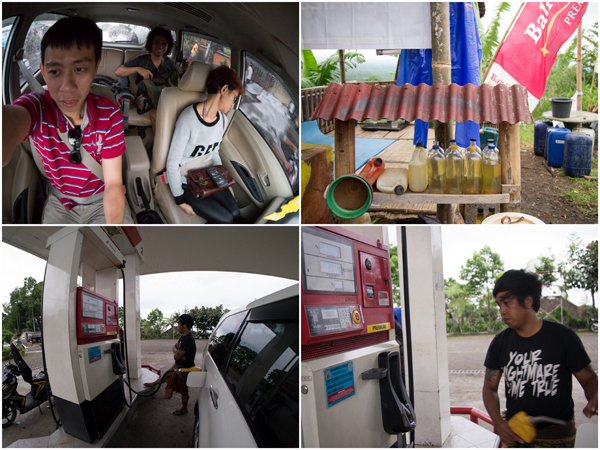 To refuel, there are gas stations, but there’re also road side stalls that offer gasoline (referred to as “premium” in Bali) by the bottles. No prize guessing which option accepts Visa. 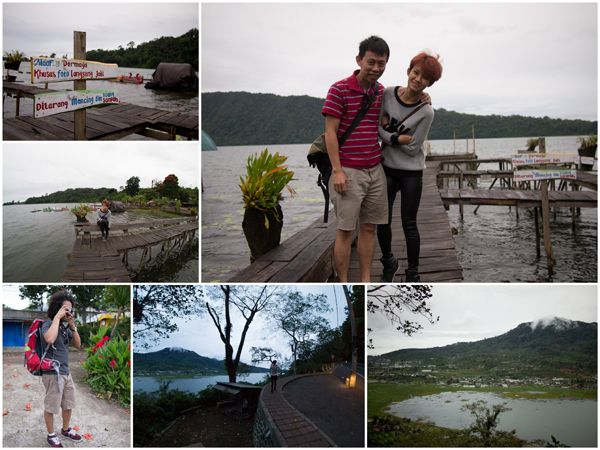 By the evening, we reached Danau Bratan, one of the three lakes in Bratan caldera, which was a Volcano that was erupted hundreds or even thousands of years ago. The lake is situated at around 1200+ meters high, making it as high as Genting Highland. It was windy and very chilly, but of course, the scenery was definitely worth a a shiver. I would love to stay a night here next time. 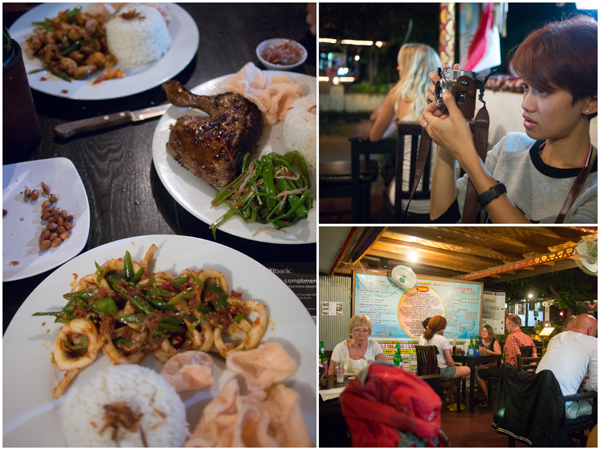 For dinner, we stopped by Warung Ayu by one of the beaches that is popular as a take off point for dolphin watching (which we planned to do). 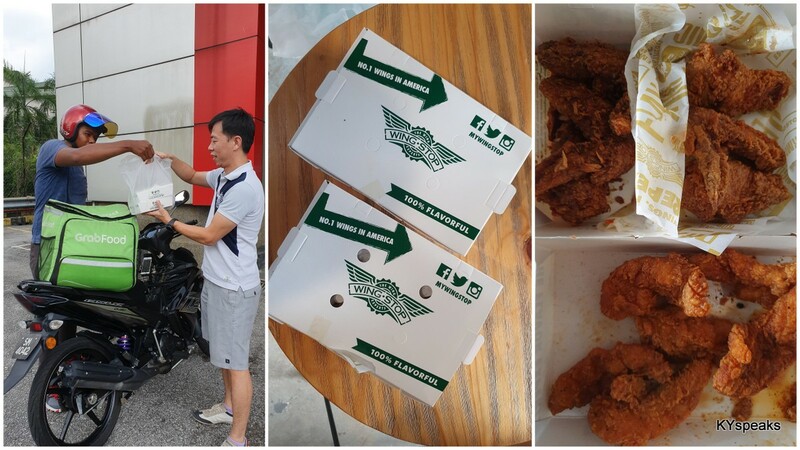 This restaurant was a complete random choice, but one that turned out to be a rather awesome! We ordered traditional Balinese food and they turned out to be very, very good. I can have that grilled chicken over and over again, it was a new taste that I’ve never had before. The server explained that it was grilled with soya sauce and Balinese sauce. I gotta try to make that some day. 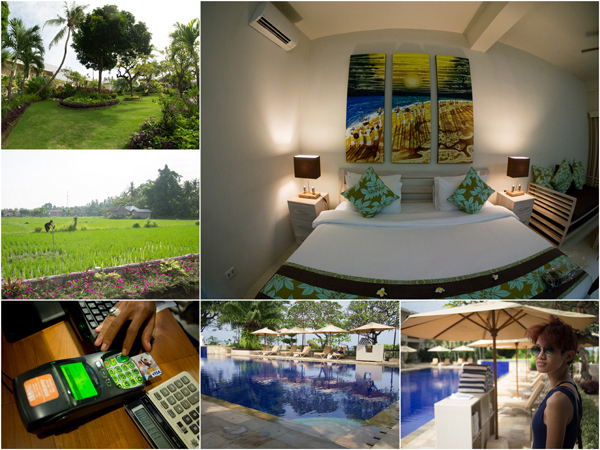 We spent the first night at The Lovina Bali hotel (about RM 380 including tax), it was a pretty lovely hotel with a King sized bed, a day bed, LCD TV with DVD player, and a small private garden too. Access to the hotel is through a beautiful paddy field, and the rear of the hotel is the Lovina beach, with a pretty decent size swimming pool too. dolphin watching started at 6am in the morning! The next morning we woke up rather early for the dolphin watch, one of the things I have always wanted to do. My first dolphin sighting was on a trip to Tenggol Island, and second being when we were at Maldives. While there are places you can swim with dolphins in Bali, I wanted to see them in the wild instead of in a confined area. 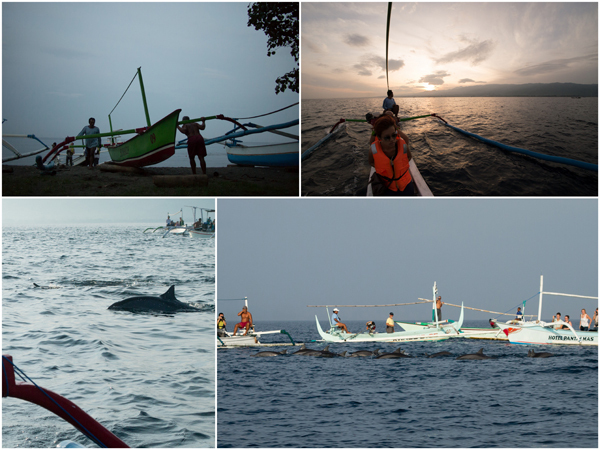 For 60,000 IDR (RM 17) per person, the boat man took us on a boat way out to the middle of the ocean. It was a lot of waiting but the dolphins did come, they were somewhat cautiously curious and did not come too close to the boats. Still, it was a very exciting experience! We hop on our car and continued the road trip after the dolphin sighting. A little over two hours and some 100 KM later, we arrived at Bali Asli in Gelumpang village. The restaurant offers traditional Balinese cuisine with an excellent view to boot. 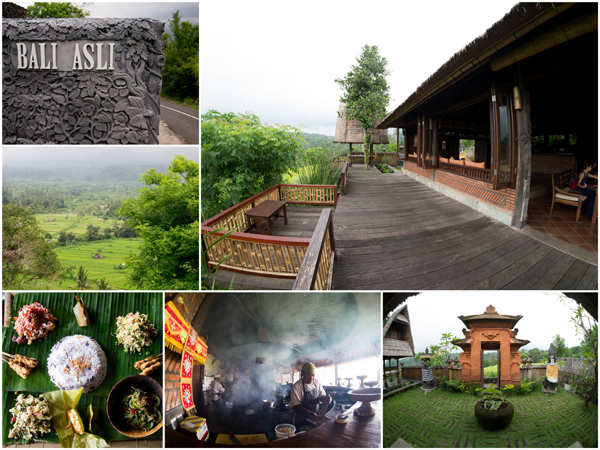 Bali Asli also accepts Visa if you book online. We had a great meal and loved the experience. At 195,000 IDR (RM 55) per person, it was very reasonably priced too. 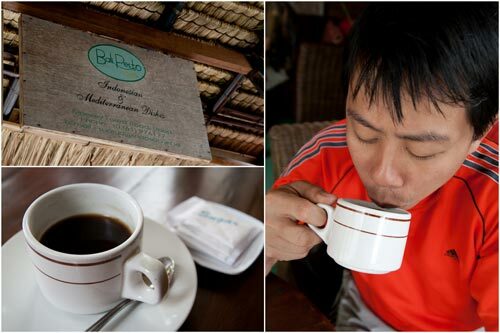 If you are at Bali Asli, Tirtaganga water place is just a little over 3 kilometers away. The water palace is a maze of pools and fountains surrounded by lush garden and many stone carvings. The water palace was built from 1948 onwards by the late heir to the Kingdom of Karangsem, definitely a place worth visiting. Entrance fee is 20,000 IDR. 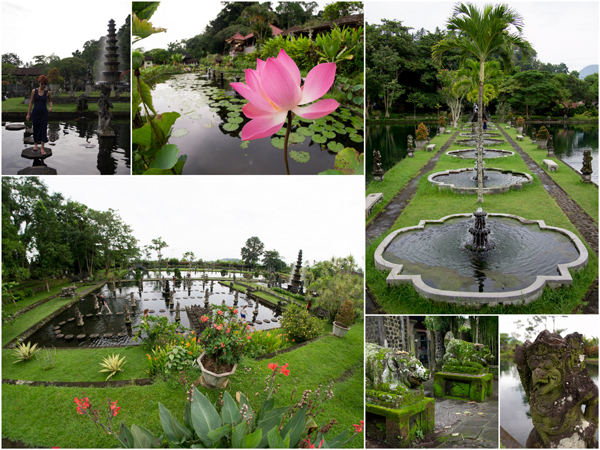 We then continued our road trip, destination Ubud, one of my favorite places in Bali. The 60+ KM journey took us another two hours on the road. 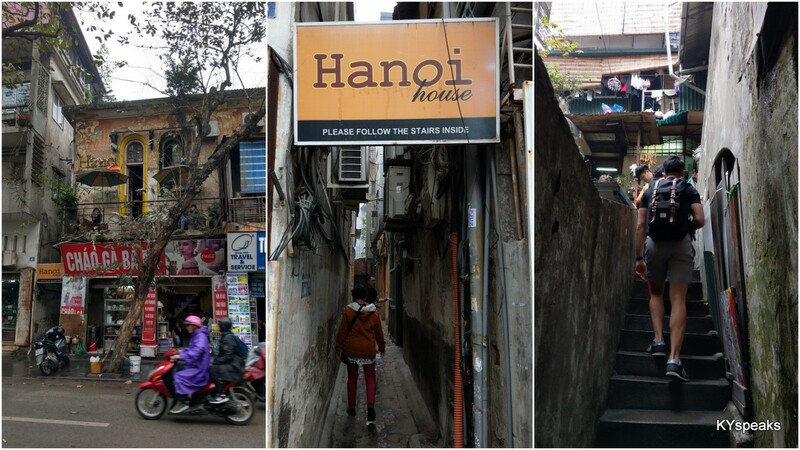 We spent some time walking around the streets littered with many shops offering local arts, paintings, and more. Haze bought a wooden mask from a local artist too. Dinner was at Melting Wok Warung. A restaurant that’s quite highly rated on TripAdvisor but one that we did not find agreeable to our taste. 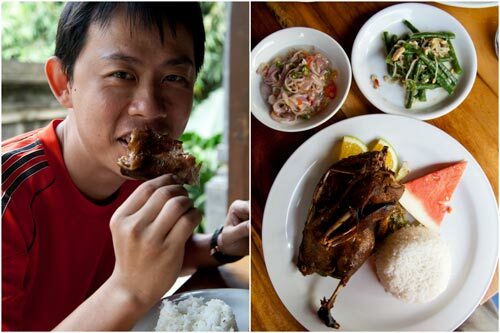 The food was perhaps catered more towards Western tourists with quasi Balinese + Western dishes. It wasn’t bad, but I couldn’t finish my minced chicken as I thought the chicken breast was too dry. If you’re a mat salleh, you might love this place though, since the place was fully booked with plenty of Westerners dining in. 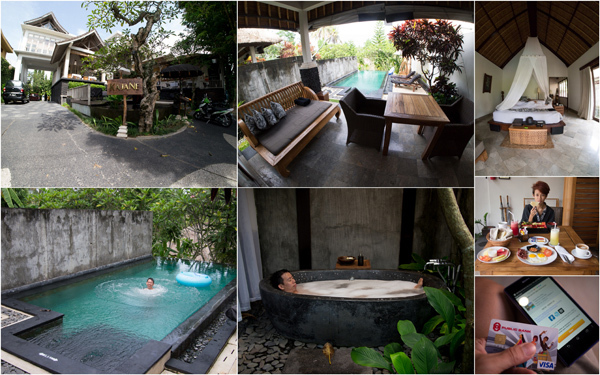 We decided to splurge a bit and checked into a villa with private pool at Kajane, one of the nicer hotels at the main stretch of Jalan Monkey Forest in Ubud. Pro tip – sometimes online prices can be cheaper than walk in, so I actually paid for this villa (RM 740) via my phone with Visa while sitting at the lobby of the hotel. Breakfast was served at our villa the next morning. My English breakfast was awesome, but it seems like Balinese are terrible at Japanese cuisine as Haze’s Japanese breakfast was rather terrible. Worst miso soup ever, it was sweet. 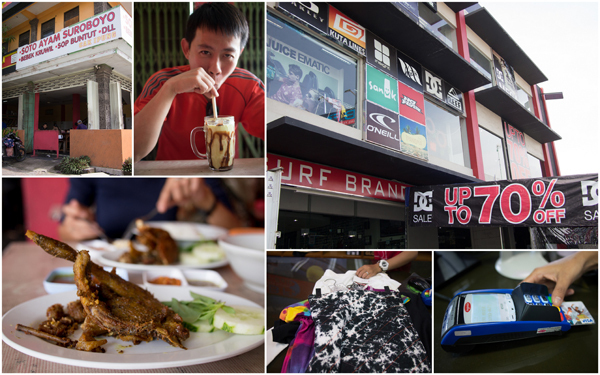 We checked out from Kajane and headed to Sanur for a bit of shopping and lunch. We stopped by Soto Ayam Suroboyo and had some pretty awesome Bebek Kruwil (20,000 IDR), a local style duck dish that went very well with rice and some Balinese sambal. I really loved it, and it tastes even better than the Bebek Bengil we tried during the previous trip, not to mention about 4 times cheaper too. Finally, we bought some cloths from one of the few outlet stores along Sanur before leaving the island with heavy heart. So, you want to travel too? You can and should participate in Visa’s contest by submitting your most creative travel photo with the hashtags #TravelHappy #VisaMY to your Twitter or Instagram account and stance a chance to win Agoda.com travel e-voucher worth RM 1,000 every week for four weeks. Click here for more! P/S: at the point of travel, 10,000 IDR = 2.81 MYR. 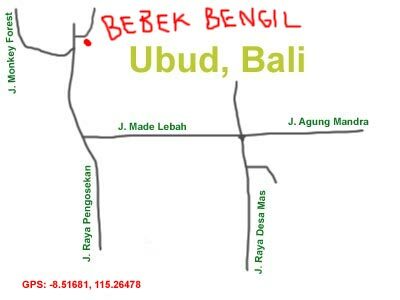 Bebek Bengil is one of the higher end eateries at Ubud. 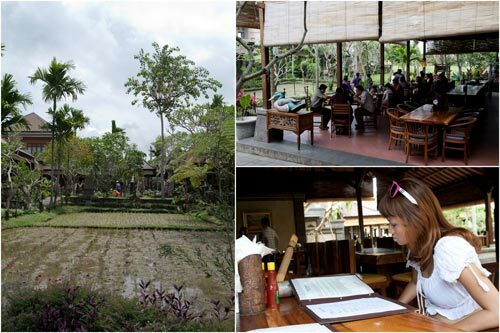 Located within walking distance from Monkey Forest, the restaurant spots several tastefully decorated alfresco style dining areas with paddy fields at the back. The place exudes class, and that was reflected in it’s price, but fortunately, also the quality of the food. When we were building the restaurant, we thought long and hard about a name. Many suggestions came from our friends, but none seemed just right. We know we wanted a Balinese name that translates well to English. However, for a long time the metaphor eluded us. We ordered two main courses, Haze had the grilled duck with sweet chili sauce (85,000 IDR) that was prepared by grilling the duck with Balinese sauce and serve with steamed rice. A side of salad and the usual Balinese style chili/tomato sauce came with the dish too. It was sweet, spicy, and full of flavor. The portion was half a duck (duck here are generally much smaller, kampung duck? ), and absolutely delightful. 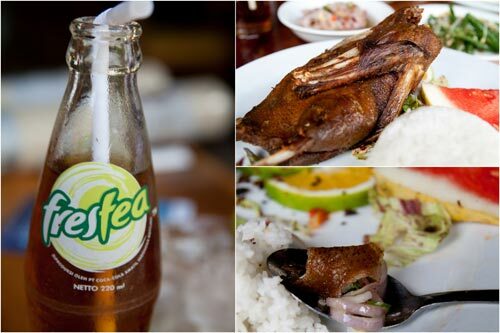 My lunch was the bebek bengil itself, the original crispy duck (82,000 IDR). It was half a duck steamed in Indonesian spices then deep fried for a crispy finish. The dish came with steamed rice (you can opt for sauteed potato) and Balinese vegetable. The duck skin was absolutely crispy and delightful, there’s also undoubtedly the distinct herbal taste that has gone into the duck meat itself. It is unlike any type of roast/peking duck I’ve had, and in a sense, this was actually much better. It was a tad salty, but every bid tasty. The lunch at Bebek Bengil was easily our most expensive meal in Bali, but it was also the tastiest. 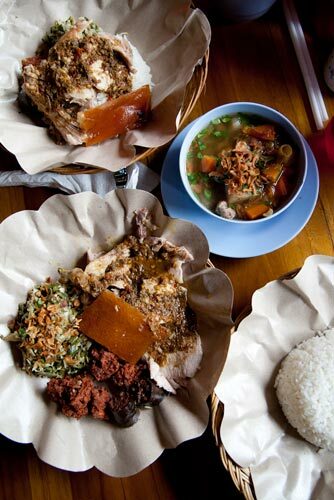 While Babi Guling might be the most famous food out of Ubud, but to me, the must-try when you are at Ubud is Bebek Bengil. 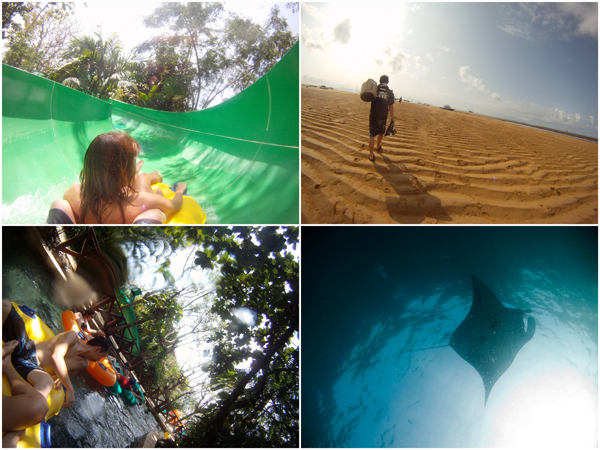 It’s time to continue documenting the remainder of my Bali trip while the memory is still somewhat fresh. 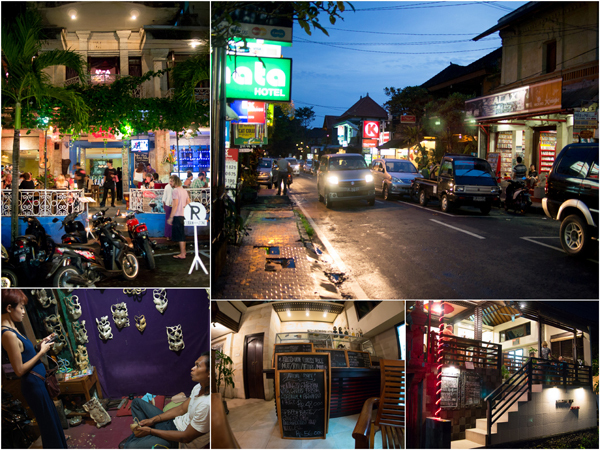 After spending a night at Kuta and two more nights at Sanur, we moved to Ubud. Located at central Bali, Ubud is about one and a half hours away from Kuta on a cab, which in Balinese traffic, only covers around 35-40 kilometers. 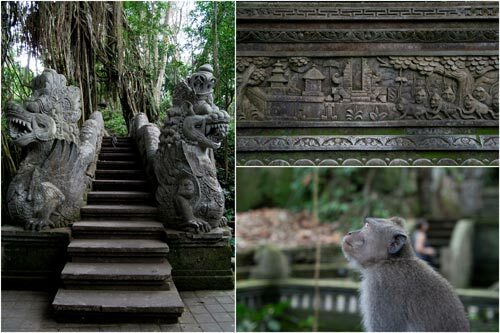 The most happening place in Ubud must be Jalan Monkey Forest, a street filled with many hotel/hostel/home stays, restaurants, art galleries, and touristy shops. It is a (mostly) narrow one way street with cars that travels no faster than you could jog. The relatively higher elevation of 200+ meters above sea level and the abundance of greenery at Ubud gave the place a slightly cooler and more pleasant temperature and than the coast. We checked into Sri Bungalows located on Jalan Monkey Forest and paid US $60 via agoda.com for the room that had a King size and another Twin bed. The wifi only works for one device at a time, but it won’t be a holiday if you constantly have to be on the internet, right? At the back of the hotel (which was a series of “bungalows” with 4 rooms each, 2 on ground & 2 on 1st floor) is a swimming pool, and next to the swimming pool are lush green paddy fields. I’m not sure if these are real farmer’s paddy fields or they’re there only for the hotel guests, but they’re sure beautiful and very relaxing just to stare at. 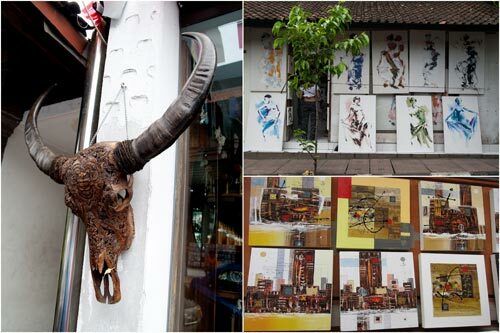 All along Jalan Monkey Forest and a few streets around it, there are art shops. Many many art shops. Ubud is the art and crafts hub of Bali, and it may as well be the art & crafts hub of South East Asia. Throw a stone in any direction at this place and chances are you’ll hit a painting. You can find art pieces from from 100,000 IDR cheap paintings to works done by famous Indonesian artists that fetches a small fortune. 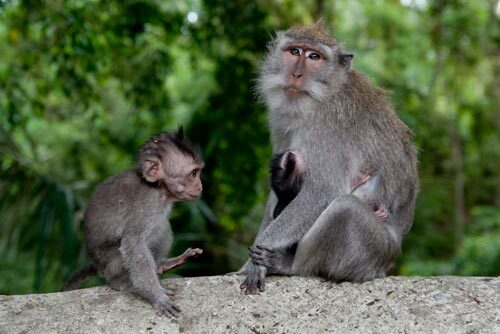 Monkey Forest (naturally located at Jalan Monkey Forest), also known as the Sacred Monkey Forest of Padangtegal, is a sanctuary with over 500 long-tailed macaques roaming about in the forest among the trees and temples. Entrance to Monkey Forest is 20,000 IDR (exchange rate was at 10,000 IDR to 3.40 MYR at time of travel). You get a small guide map and plenty of advertisements. There are 2-3 entrances into the sanctuary, and ticket counters are right next to each of them. There are villagers selling bananas, peanuts, and other fruits you can purchase to feed the primates. It doesn’t take more than an hour or so to explore the entire Monkey Forest. There were certainly a lot of monkeys, and some of them quite daring too if food is presence. 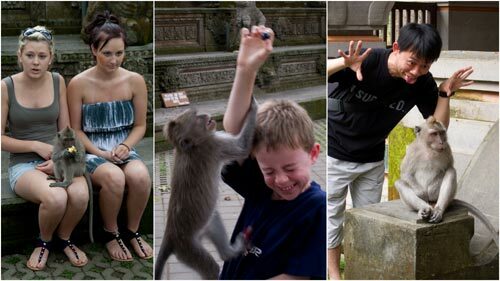 Fortunately, the monkeys are non aggressive for the most part. Kopi luwak, or civet coffee, is one of the world’s most expensive and low-production varieties of coffee. It is made from the beans of coffee berries which have been eaten by the Asian Palm Civet (Paradoxurus hermaphroditus) and other related civets, then passed through its digestive tract. More about that in the wiki entry of Kopi Lewak. This cup of kopi luwak cost me 46,000 IDR including tax, which translate to something like 1.5 cups of Starbucks. I had it black and did not add any sugar, and true to its reputation, the coffee wasn’t very bitter and carry a pleasant aroma. It pretty nice coffee, but I don’t see the what the hype is about though. 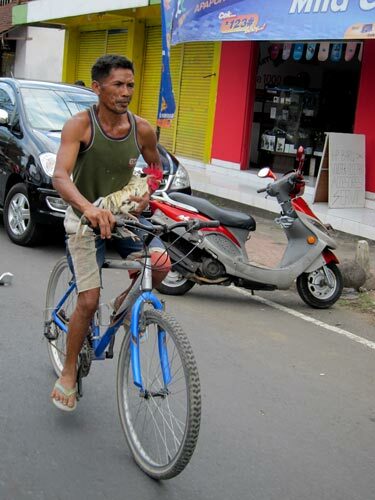 And after that 3 dogs on motorcycle photo in the last picture of Kuta post, I shall end this post with a photo of this chicken transporter Haze managed to shoot while we were riding on the rental motorbike around Ubud. 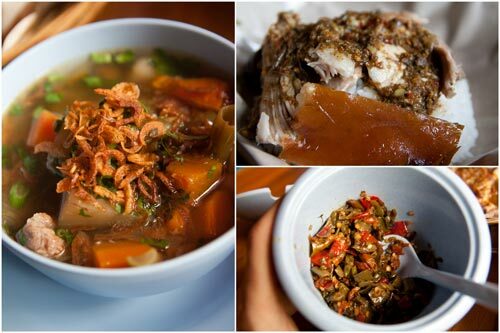 While Bali isn’t exactly a dining destination, there are several “must eat” places on the island. One of them is Ibu Oka’s Babi Guling at Ubud, partly made famous by Anthony Bourdain, the person whose job I wouldn’t mind swapping with. 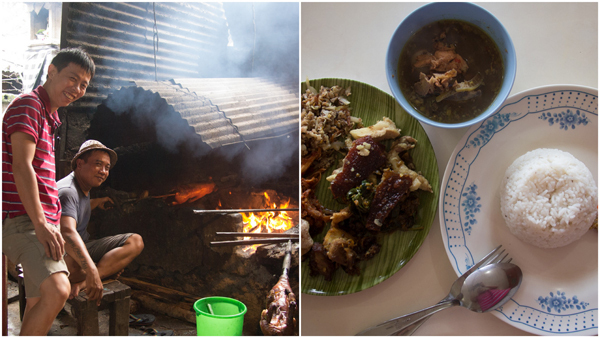 For those unfamiliar with this dish, Babi Guling literally translate to “rolling pig”, and has it’s name taken from the way the pig is prepared – by puttin the smallish pig on a stick and keep rolling it over coconut husk fire. 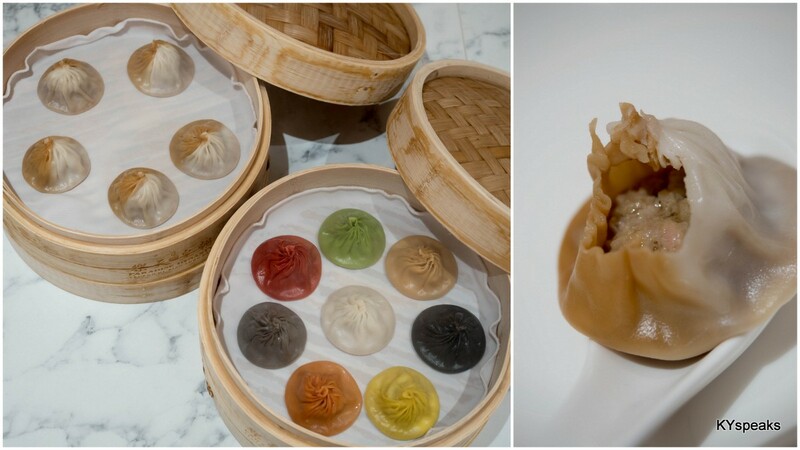 The pig must previously be stuffed with shallots, garlic, galangal, lemon grass and dried shrimp, among other things. This is to add flavor while removing any pungent “pork” smell. We visited the branch of the original Ibu Oka Babi Guling, a cleaner and bigger place with proper table and a much airy environment. 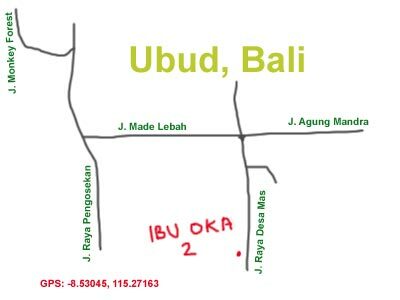 One reason I choose this location at Jalan Raya Desa Mas is that we had passed the restaurant on the way to Ubud and hence I knew how to get there, and secondly, the original place has been written to death and there is no need for yet another article for it, I suppose. We arrived there at around noon on a weekday, the place had a healthy stream of diners, but no huge crowd as you would find at the original warung. We ordered a set with rice, vegetable, pork roll, fried meat, sausage, and pork skin for IDR 30,000 and another set with rice, “complete meat”, and soup for IDR 50,000. To be honest, I can’t tell what the fuss is about. The meal turned out to be very average for me (but in the case of Bali, above average), the meat was a little too gamy and still carry a bit of pungent smell. The skin was too tough, the sausage too is something I wouldn’t order again, it was a bit too “unrefined”. Our roast pork and Chinese sausage triumph this any day. That being said, the soup was rather tasty, and with a bit of their spicy chili paste, the combination of meat and rice was decent too. Still, all that hype, it was a bit of a let down. Perhaps the next time around I”ll try the main branch to see if there’s any difference, but for now, babi guling isn’t one of my must-eat item at Ubud, but I’ll still eat it if it wasn’t out of the way.